A friend was recently talking to me about taking their child sledding and it brought back a memory I want to share. We have the coolest sledding spot around. We drag sleds partway up a gated logging road, to a place where it’s steep enough for speed, has some corners, and shallow ditches for crashing into brush. There’s no traffic and few people because most don’t want to go to the effort of hauling everything way up there. But the trade-off is a spot in winter woods where you can shout and slush through snow and fly fast under the trees. One winter my friend and I were up there with a bunch of kids. Her husband waited at the bottom of the road. He had a fire going, with hot dogs and snacks. When it started getting dark and all the hot chocolate was gone, most of the kids quit sledding and headed down to the fire. My friend and I weren’t ready to go yet, and neither were her daughter and my son. 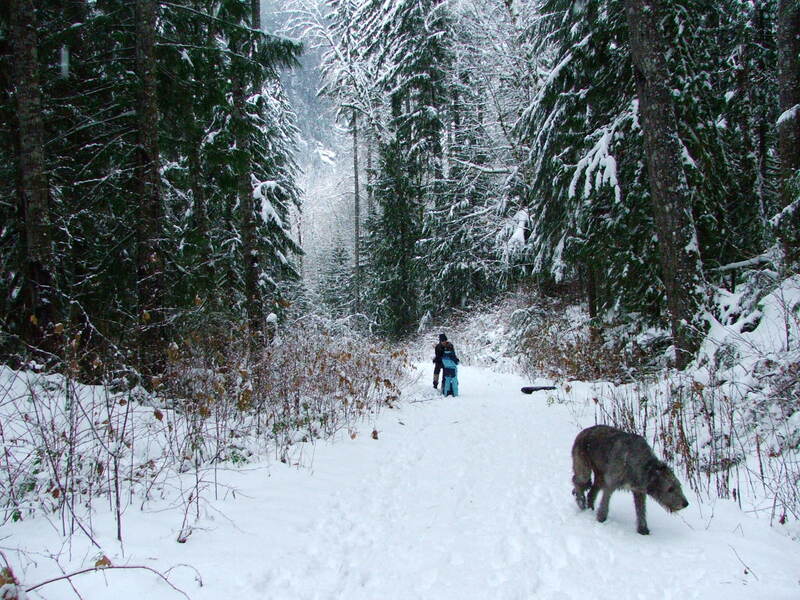 We put the two on our sleds and hauled them up the logging road, hiking into the winter twilight. It was that deep quiet that falls under trees in snow. Just the sounds of the sleds, our breathing (some huffing and puffing as the road gets steep), cracking of branches off in the woods, and the sounds of sluggish cold water in the stream. We hiked high in the woods until it was dark and then my friend and I sat on the sleds with the two kids, and sledded our way back out to the fire and laughter, taking our time. We wanted to prolong the magic of the winter forest as long as possible. Those moments when we were pulling the kids behind us were beautiful. The still woods, the sense of life hibernating, the deepness of winter, and that shadowy light under the trees when it’s near dark, all made me feel as if I’d stepped into sanctuary. I tried to post a video of sledding in that area, but couldn’t get it to work. Instead I’ll just pop in a photo. For a good winter book, try The Snow Child by Eowyn Ivey. You touched some of my own memories of winter. I think it is the deep quiet I find most enchanting. Thanks for the post! You’ll have to come sledding with us one of these days. Right now the snow is frozen solid though. You’re right about the enchantment in the deep quiet. There’s nothing like it. What I didn’t think to include in the post was that I was hiking with a poet, which added its own layer to ‘once in a life time’ moments. Seems like an idyllic place you live in over there. Lovely memories. Another wonderful book for this time of year is ‘A Winter Book’ by Tove Jansson – a collection of spiky, offbeat short stories from the ‘Moomins’ lady. I’m going to look that one up; haven’t read it. Thanks for the suggestion. Beautiful post about snow! That picture…the place truly looks magical. I love the quiet that comes with heavy snowfall. It’s like the world stands still for a moment.